It's one of the few things upon which everyone (except the President) pretty much agrees. Scott Pruitt’s tenure as head of the Environmental Protection Agency has been anything but smooth sailing. Disastrous environmental policies aside, Pruitt has come under fire for alienating longtime EPA staffers. Has been notably opaque, both within the agency and with the public, about who he meets with (many suspect he’s spending most of his time lending an ear to people from the oil and gas industries). He’s been criticized repeatedly for ethics violations — from flying first class to excessive spending on security detail to renting an apartment from a lobbyist for cutthroat rate — seemingly by everyone but the President. People who care about the environment and (unlike Pruitt, the head of the E P freakin’ A) believe in climate change, have been calling for his ouster for a good while now. Now, that $43,000 soundproof phone booth (that some believe reeks of corruption) seems to be the final straw. Those calls have reached a fever pitch. They’re coming loudly from lawmakers. Yesterday, a bipartisan coalition of 170 Senators and Representatives, led by Senator Tom Udall (D-NM), filed a resolution calling for Pruitt to step down. 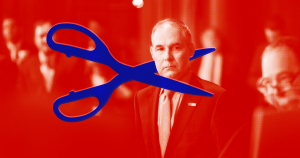 They call for this action based on, among other reasons, Pruitt’s “[misuse of] taxpayer dollars by spending those taxpayer dollars on excessive personal conveniences and unnecessary office enhancements while dramatically cutting budgets and staff for critically important enforcement, research, and implementation activities,” according to the resolution. And they’re coming from the unlikely alliance of labor and civil rights nonprofits. Yesterday, a coalition of NGOs including the NAACP and the Sierra Club, ran full-page ads in three major newspapers, the Washington Post reports. President Trump would be foolish to ignore these calls. He risks a disagreeable Congress that might not cooperate when he demands immediate action on his pet legislation. He also risks further disapproval from his electorate, who may decide they no longer want Trump’s easy, breezy, Republican-dominated Congress in this year’s midterm election. And, yet, Trump may not heed these calls. Pruitt has done exactly what Trump has wanted him to do (namely, gut the EPA). And continuing to distract people while Pruitt quietly strips away any remaining environmental regulations fits neatly into that plan. The White House has no choice but to investigate that pricey phone booth. But for now at least, Pruitt’s tenure isn’t over.